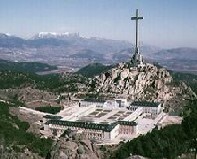 The Valle de los Caidos & El escorial are 45kms to the North east of Madrid. Despite only 15km´s seperating the two Spanish monuments the contrast between them could not be greater. El Escorial is one of the oldest and most famous monestaries in Spain whilst the Valle de los Caidos is a monument to Spanish facism. Neither origin should deter you from visiting both as comparative monuments do not exist in the world. Now for the bad news: Since the 6th April 2010 the Valley of the fallen is CLOSED to visitors until the structure can be made stable. At the present time (Sept 2010) the technical evaluations and a reopening date have not been declared. El Escorial remains open. Train: Cercanias Line C8A to El Escorial. From Madrid Atocha, Recoletes, Nuevos Ministerios and Chamartin stations every 1hr from 0545 as well as half hourly services during morning and evening peak travel times. A return ticket costs €6,10. Last return is at 2215. Bus: Bus 661 from Moncloa interchange (Metro and Bus station) every 15-30 minutes from 0700 - 2330 (reduced schedule on weekends) at a cost of €2,50 each way. Last return at 2230 and journey time is no more than 1hr subject to traffic. Road: Take the A-6 North east from Madrid and exit after 45km onto the M-600. At the exit beneath the motorway you turn either left (Valle de los Caidos) or right (El escorial). Driving time is approx 35 minutes without traffic. In the shadow of the monastery the mountain village of El escorial has built a reputation for fine food and hospitality that attracts many Madrileños each weekend. The 16th century monastery was built in honour of Saint Lawerence after he supposedly aided the then King to a great victory. Since this time it has gone on to become the resting place of the Spanish nobility as well as housing a unique collection of manuscripts and various famous art pieces. Attached to the monastery on the south facing side is a garden of the type more commenly associated with French chateauxs or English county mansions. This includes one of the earliest forms of reservoirs which is still used today to supply the garden during the summer heat. Lunch or dinner in the surrounding village is of typical Spanish fayre and apart from the odd pizza parlour you will be hard pressed to get away from fresh meat and suprisingly seafood. A number of tourist shops and quirky antique shops mean there is something for the souvenir hunter who wants something unique with paying through the nose for it. Set between two spurs in the valley of Cuelgamuros, in the Sierra de Guadarramasits, is the worlds largest free standing cross (over 150m high 450 plus ft). Constructed from the 1940´s onwards and by over 20,000 prison labourers from the defeated communists the cross and its underground tomb were ordered by Franco as a memory of the sacrifices made by the Facists in the Spanish civil war. Ultimately it became his final resting place. Visiting this monument one cannot fail to be impressed by both the size and extravegance. One should however remember the political signifigance of the site and to do so it is best to either read up before visiting or purchase one of the associated guide books. Whilst designed as a monument to the fallen, fourteen people actually died during its construction. Directly beneath the cross inside the basillica is the grave of Franco and whilst both loved and hated by the Spanish of today his resting place does not suffer from vandalism. Leading up to the grave is a large hallway decked out with religous paintings and art works. It is possible to ascend to the base of the cross either by tram car or an hours walk through the monastery at the rear. A far easier option is to go up in the tram car and walk down afterwards! Note that for disabled visitors access is only possible by using tram car. Monastery El escorial: Adult 9€, Child 6€ (guided tour), 8€ & 4€ unguided. Both: 10€ Adult 7,30€ Child (guided monastery part) or €8,50 unguided (no concessions). Under 5´s Free and 18th May is free entry for all. Residents Tip: Do not visit the Valle de los Caidos on the 20th November when Spains Facist community congregates to celebrate Francos memory and honour him. This has been the scene of disturbances in the past. If the Valle de los caidos is not your thing you can always check out other Madrid excursions here!